All provinces of northwestern Luzon reported declines of mangrove forests but the rates of losses are unclear, given the insufficient available information. The main problems can be generally categorized into two: (a) conversion of mangrove habitat to aquaculture ponds and residential areas, and (b) vulnerability to natural disasters (Figure 1). For 73% of the region, the primary cause of mangrove decline is the conversion of mangroves into aquaculture ponds and residential or commercial areas. The provinces of Pangasinan, Zambales and Bulacan attributed high mangrove loss due to conversion to aquaculture ponds. Most of the massive conversion of mangrove areas happened in the 1970s, opening spaces for building residential, commercial and even industrial areas (Figure 1A). Notable examples are the provinces of Bulacan and Bataan, which became hotspots for high human migration and urban centers because of several industries that were established. Localities reported as highly vulnerable to natural disasters were consistently the same localities that had massive losses of mangrove areas (Figure 1B). The most serious threats are typhoon damage, erosion, land subsidence and sea level rise. Cagayan is known to be a passageway of most strong typhoons in the country. Coastal erosion, combined with quarrying activities, further aggravates land subsidence. Aside from typhoon, the provinces of Pangasinan, Zambales and Ilocos Sur also reported storm surges. Some of these catastrophic typhoons happened in the last ten years. These provinces also documented evidences on shoreline change attributed to sea level rise. Some coastal areas drop ~0.5–1 m of elevation and lost ~100 m of shoreline. 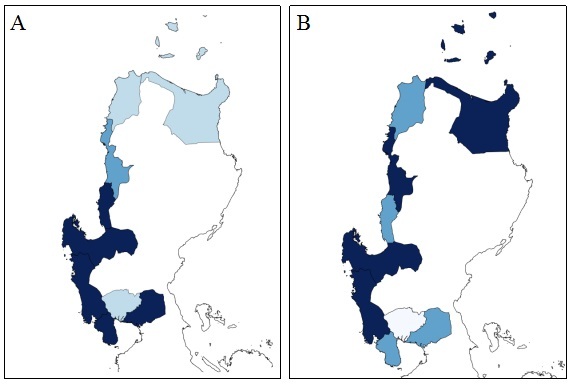 Provinces with severe concerns on: (A) conversion of mangrove into aquaculture ponds and residential areas; , and (B) areas exposed to natural hazards , (i.e.g. erosion, land subsidence and sea level rise). Thicker Darker color shades indicates more severe problems.